The rise of outdoor cinema: why do we love it so much? The Toronto Outdoor Picture Show (TOPS) continues to expand its popular programming in parks across the city each summer – people can’t get enough! Here are five main reasons why Torontonians love outdoor cinema. On Sunday July 8th 2018, I watched Casablanca at Christie Pits Park: “I think this is the beginning of a beautiful friendship” Rick Blaine says to Louis Renault as they both walk into the fog. Casablanca was recently screened by the Toronto Outdoor Picture Show (TOPS) as part of the Christie Pits Film Festival, and much like the growing solidarity between Rick and Louis at the end of this movie, Toronto park-goers and outdoor cinema are experiencing a blossoming friendship. 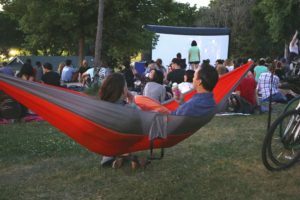 Originally founded in 2011, the Christie Pits Film Festival is a free weekly series of outdoor film screenings held each summer in Christie Pits Park, Toronto. The festival is now entering its eighth season, and runs from June 24th to August 19th. Since its inception, the festival has grown rapidly and has become a summertime staple for the Christie Pits community. 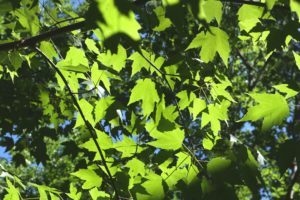 In 2015 TOPS incorporated itself as a non-profit organization and this year presents programming in three other Toronto parks including, Fort York National Historic Site, Corktown Common Park and Parkway Forest Park. 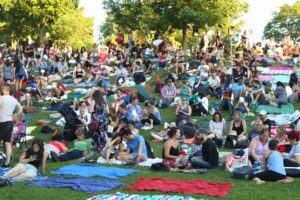 All four parks, (including Christie Pits), have outdoor film screenings this summer, many of which fall under the Arts in the Parks banner. The theme of TOPS’ film programming this year is ‘Cinematic Cities’, which features films about “cities and the people who make them special, at home and around the world”. 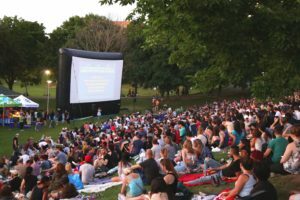 Upcoming feature films in the Christie Pits Film Festival include Ocean’s Eleven, Amélie and Before Sunrise, and each feature film is presented with complementary short films. I spoke with festival founder Emily Reid who explained that this year’s short films are set in Toronto and are made by Toronto film makers, making their film lineup more local than it ever has been before. 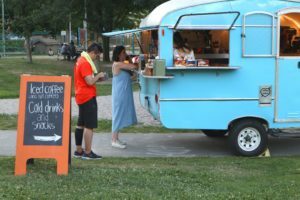 I arrived to Christie Pits Park on Sunday June 8th around 6:30 pm, and I was just in time for the ‘Eats and Treats’ portion of the event when food and drink vendors open for business. I grabbed an iced coffee and mingled with the crowds of people in the park to ask them, “Why do you love outdoor cinema?” None of the answers were particularly surprising, but they did confirm that Torontonians really do love watching movies outside in the park! Here are the top 5 reasons I heard, in no particular order. 1. It’s free and you can bring your own food and drinks! Many of us know the expenses associated with going to see a movie at an indoor theatre, but luckily movie nights presented by Toronto Outdoor Picture Show are free or ‘Pay What You Can’. TOPS is focussed on making high quality diverse films more accessible to audiences everywhere, making their film lineup a perfect fit for Arts in the Parks which supports arts access: “It’s like a free backyard movie party with our favourite snacks and everybody is invited” said Mila from the Junction. Don’t forget that you can bring your own snacks and drinks to the park, which is another great way to cut back on costs and enjoy your favourite treats. Helmut the Pug is a fan of Chicago Mix popcorn! 2. You get to be outside and have a beautiful backdrop with your movie! “I love the opportunity to be outdoors and soak up the sunshine,” said Neil from Parkdale, “Nature is a natural anti-depressant so I’ll take any excuse to connect to the trees and the grass and the fresh air.” By taking an activity that is normally enjoyed indoors and bringing it outdoors, Torontonians can get outside and enjoy summertime to its fullest potential (especially before winter settles in again – Canadian summers are too short). Many people I spoke to at Christie Pits Park agreed that enjoyment of local parks was a main factor in why they attended the movie. Plus, can you really complain about having green trees and a colourful skyline as your movie backdrop? 3. You can enjoy more than just the movie! Another great thing about outdoor cinema is that you get to enjoy a combination of entertainment, with the movie as the final event of the night. I saw many groups of friends and family members throwing Frisbees, playing cards, chatting and laughing, swinging in a hammock or enjoying food together throughout the evening: “Here you are sort of combining a camp day with a movie night. We get to play soccer, eat and then cuddle up in a blanket and watch a movie,” Alex from the Annex told me with her 6-year old daughter Sofia. A movie night in the park is a great way to get a full evening of activities in and enjoy the company of others. 4. It’s a great way to connect with your community! 5. Everyone is welcome, kids and dogs too! 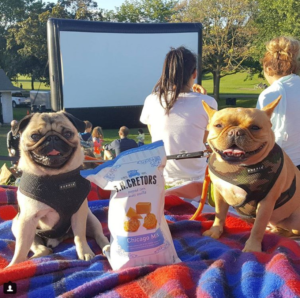 Finally, Torontonians love outdoor cinema for the simple reason that everyone is welcome – even our four-legged family members: “[Jeeves] might like it more than me because he makes lots of dog friends, but it’s cool to walk up here and watch a movie with him. You can’t really do that anywhere else except at my apartment and that’s not as fun,” Isaac from Kensington told me with his pup Jeeves. All Arts in the Parks events are meant to be accessible to all types of people (and in this case animals too). The film events put on by TOPS are ideal for families with young children, couples on a date-night out, or large parties looking to catch up and enjoy a free event together. 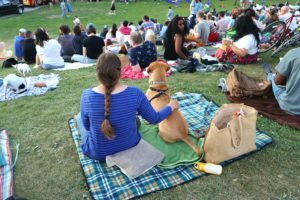 Overall, I thoroughly enjoyed my movie experience in Christie Pits Park and I plan to attend another one or two films before the summer ends. If you’re interested in attending, you can find the TOPS summer film lineup here. Remember: the ‘Eats & Treats’ portion starts between 6 and 7 pm, the films (short and feature) start at sundown and BYOBlanket and or chair. Enjoy the show! To The Table: A gathering place in a small outdoor space. Kicking off summer with a bang (on the Taiko)! previous post: Kicking off summer with a bang (on the Taiko)! next post: To The Table: A gathering place in a small outdoor space.